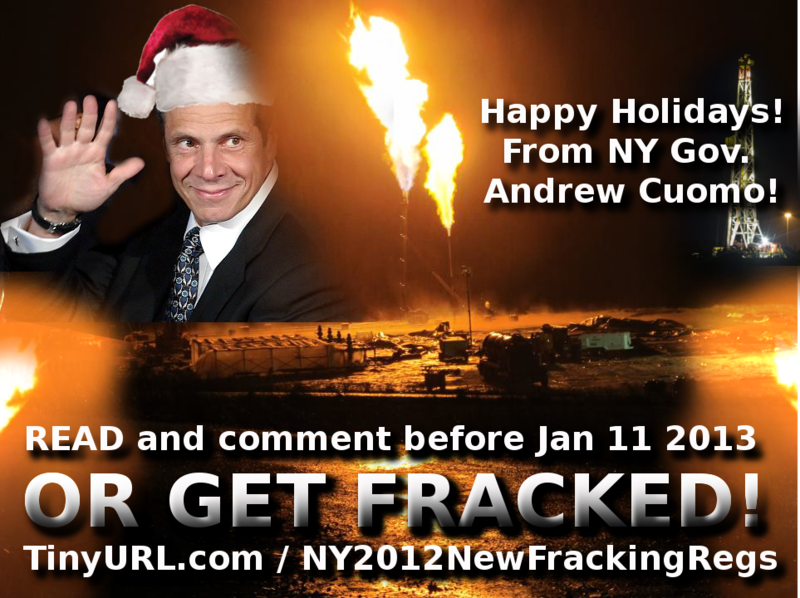 The new 2012 NY Fracking Regs (draft) are out. December 12, 2012 through 5:00 PM on January 11, 2013. Revised Rural Area Flexibility Analysis - information about compliance with the rules; costs; minimizing adverse impacts; and rural area participation. Revised Job Impact Statement - information about the nature of any impact and self-employment opportunities. Revised Regulatory Impact Statement Summary - brief description of the statutory authority and legislative objectives; needs and benefits; cost to industry; state costs; local government mandates; paperwork, duplication; alternatives; federal standards; and compliance schedule. Revised Regulatory Impact Statement - detailed explanation of the statutory authority; legislative objectives; needs and benefits; cost to industry; state costs; local government mandates; paperwork, duplication; alternative approaches; federal standards; and compliance schedule. Revised Regulatory Flexibility Analysis for Small Business and Local Governments - information about the effects of the rules; compliance requirements; professional services; compliance costs; economic and technological feasibility; minimizing adverse impact; and small business and local government participation. Revised Summary of Express Terms - the proposed rules include revisions and additions to oil and gas regulations; regulations on the management of state land; and regulations pertaining to State Pollutant Discharge Elimination System (SPDES) permitting. Assessment of Public Comments Summary 6 NYCRR Parts 52, 190, 550-556, 560, and 750 - Summary of comments received during the comment period. Assessment of Public Comments 6 NYCRR Parts 52, 190, 550-556, 560, and 750 - Comments received from September 28, 2011 through January 11, 2012.